Since 1994 Pureflex has been a world leading manufacturer of high end Fluoropolymer and Composite products and technologies. Specializing in the manufacture of fluid handling and sealing products specifically designed for pharmaceutical, chemical, and ultra-pure related industries. Through technology and innovation, Pureflex has earned a reputation for providing safe and dependable hoses, valves, and flanged products. Pureflex offers SmoothFlex™, Flexchem™, MTH™, Nexus™, Ultraflex™, Multiflex™, Proflex™ and others products for all types of applications requiring chemical, sanitary and industrial compatibilities. Available in braided smooth bore, convoluted tube, and stainless steel or poly-braided covers. 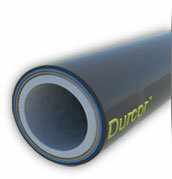 All Durcor pipe and flanges are manufactured with glass fibers and a premium grade vinyl ester resin in an automated manufacturing process developed by PureFlex for composite pressure piping. Inner heavy wall virgin PTFE pipe liner provides maximum chemical resistance.